Only 113 days to go! Willie Nolan is the youngest of five children. He was born in England like his two brothers and two sisters. When his father became ill he moved back to Ireland to the family home in Achill, Co.Mayo and that is where he has lived with his mother for the last thirty five years. He has been a service user at Western Care Association for over thirty years now attending the Vocational Training Center in Castlebar five days each week. William competed in the Special Olympics for Ireland in swimming, which Western Care put him forward for, and he won many medals. Willie always loves to show his medals to everyone and tell them all about his swimming. He has also competed for Ireland in bowling in several different competitions! William has a massive medal collection for all the events his has participated in, all thanks to the help and support that Western Care have given him. William has made many friends while at Western Care from other service users to carers that he loves telling his family all about. 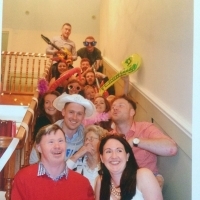 When William's mother became ill and passed away in 2018 he moved to Western Care's Garyduff Residential Home in Castlebar. This has been a great move for William, he loves it there. William is a fantastic uncle to thirteen nieces and nephews and two great nieces and a great nephew! William's nieces and nephews really want to give back to Western Care to say Thank You for all the help and support they have given William and his family over the past thirty-plus years so we have decided to do The National Three Peaks Challenge on August 16th, 2019. Please support one of us with a donation on this site and help us support the marvelous charitable organisation that has supported our uncle William for more than thirty years ... your support will be greatly appreciated!